Celestron manufactures the Ultima line of Prismatic Spotting Scopes in 65mm, 80mm, and 100mm varietals to suit your needs. All the Ultima line are mated to an eyepiece and render views that are both rightside up and laterally correct to the world, making them good for both terrestrial and celestial observing. All Ultimas are waterproof, making them more robust than ever before. Celestron surely is delivering exceptional value. The Ultimas now offer the choice between 45° angled viewing or straight-through viewing as you prefer. Most users will prefer angled scopes because they are both simple to use for birds perched high above the viewer as well as easily simultaneously shared among users of differing heights. But some will prefer the straight-viewing models, for these are much easier to use when hunting down the object of interest in the first place. Straight-viewing models are also usually a bit lighter, brighter, and less expensive. The choice is yours. The Ultima 100 is among a handful of spotting scopes with an enormous objective lens diameter of 4", and as such is a large and weighty scope at that. But from dawn to dusk, and everything in between, you'll constantly be reminded of that objective lens size as everything you'll see will be that much brighter in the viewfinder. Certain Celestron products include their wonderful "No Fault" warranty coverage, which assures that your binoculars will be repaired or replaced at Celestron's option for as long as you own them—no questions asked. The only requirements on the user's end are to ship the scope (at the user's cost) to Celestron with a proof of purchase and a check or money order for $25 to cover the costs of inspection, shipping, and handling. This warranty service is valid only for USA and Candadian citizens purchasing from an authorized Celestron dealer. The Celestron Ultima series feature a T-mount threading upon the eyepiece barrel, allowing your scope to act as an ultra-telephoto lens upon your SLR camera (digital or film) with just the addition of a camera-specific T-mount adapter. Peepsight for quick initial location of your subject. Smooth focus knob can be turned with a single finger. 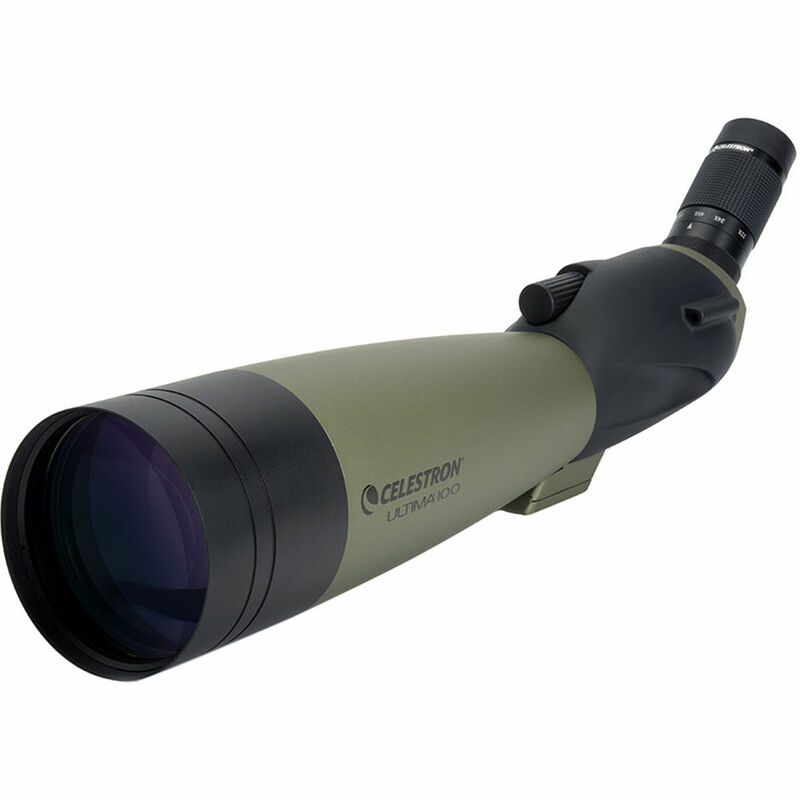 Box Dimensions (LxWxH) 23.0 x 7.7 x 6.9"
Ultima 100 22-66x100mm Spotting Scope (Angled Viewing) is rated 4.1 out of 5 by 32. Rated 5 out of 5 by Ron from Awesome scope! I am a hobbyist astronomer and avid long range Target shooter. I have owned scopes for many years both astronomical and spotting scopes for target practice. I really did a lot of research before I purchase the scope and it was not the first one that I purchased in its class. I was more than surprised at how wonderful the image was at all powers from the very center of the view to the periphery of the view field. The detail even at the highest power is incredibly Sharp in the entire field of view. I highly recommend this scope and having had experience scopes worth in the thousands of dollars this holds his own and is well worth every cent and far more. Rated 2 out of 5 by Fernando from Much better the Ultima 80 First I get the Ultima 80 to watch the mountains from my balcony in Santiago,Chile and I start to watch the moon and some planets (Jupiter and Saturn looks small but very sharp and clear) and I liked so much that I want to improve it so I sell it and get Ultima 100. That was a big mistake, because the Ultima 100 it gets never on focus, always a little bit out of focus. Also has a lot of blur when you see something bright light a full moon or a mountain top in a sunny day. I pay almost double and get less than the half. Rated 1 out of 5 by VitaminX from Extremely disappointed image quality! The one star rating is not given to B&H. The service of B&H is second to none. Looking for a spotting scope for a while. After reading some reviews, I purchased the Ultima-100. Thanks to the great service of B&H, package arrived in 3 days. To my surprise, the image of the scope is far from acceptable. The sharpest image at the lowest magnification I could get is still blurred, even at the center of the viewing field. The image is even worse when zoomed in. It is just the level of a toy scope or worse. B&H accepted my return requirement immediately. Again very appreciated to the service from B&H. Definitely not recommend to friends. Rated 5 out of 5 by Noel_B from Cheap and Good ! I just moved to a high-rise home, and was looking for something that I can use to view far away places. For this price, the build quality is superb. The 100mm lens is smaller than I expected. It was easy to setup using some common sense. All components were in their pouches! It was for home use hence its size was not a problem for me. However, do invest in a sturdy tripod. This is my first spotting scope and I found the view to be just nice at 22x, but extremely hard to use at 66x. I am a glasses wearer. I did find some purple chroma at high contrast areas but they weren't show-stopping at all. Overall I am rather pleased at this first spotting scope of mine. Rated 5 out of 5 by John (Jack) from Just what I was looking for I purchased this scope for multiple reasons. Mostly for using at the shooting range, but also for other uses including as a lens for my camera. I am extremely pleased with my choice. First use proved that the image is clear and bright even with the low light conditions at dusk. The test used was to spot targets at 50' & 100'. The scope was then tested at a known distance of 1000'. I could count the kernels of grain on a stalk of wheat at this distance. I found that the zoom and focus controls operate smoothly. The performance of this scope and reasonable price are hard to beat. Rated 5 out of 5 by twh9000 from This is one precise scope Used primarily for casual astro-observing. I was quite please with both the build quality (very solid) and optical quality (absolutely no apparent CA when viewing bright objects such as the moon or Jupiter). Images are crisp and clear - and with the micro focuser - they are easily brought into sharp focus. I have also used the Celestron Ultima 100, which although it is a good scope for its price - the difference the F-ED glass makes on the Regal is very apparent and well worth the extra cost. Having owned a number of other scopes up to 10 Schmidt Newtonian - it is a real pleasure to go observing with this relatively light weight scope. Rated 4 out of 5 by Bill McGrath from Good scope for the money I use this as a terrestrial telescope with some casual astronomical observing thrown in. I've owned some large, expensive telescopes, so I was curious how a sub-$ scope would do. The answer is: more than adequately. Yeah, the image starts to get a little fuzzy at the highest magnification, but it's still pretty good. Atmospheric shimmer is a bigger problem. I could have spent twice the money for an ED objective, but that probably wouldn't have netted me a big improvement. I mount the scope on a high-end carbon fiber tripod that I usually use with my Nikon D800; a solid mount is essential. Overall, a good buy. Does it come with Tripod mounting adaptor ? if not what adaptor is suitable for this scope? Are there any extenders or eyepieces for increasing the magnification? Scope is just OK at 200 yards and would like something to see targets at 300 yards; less than an inch. Take the scope to any astronomy store and they will be able to fit you with an eyepiece to suit your needs. Do not be surprised though if the eyepiece costs more than the scope and even several times more. I have a canon T3i. Can I take clear pictures through this scope? What is the B&amp;H part number to attach the T3i? What do I need to attach a Nikon D5100 to a Celestron Ultima 80 or 100? This scope is about on the limit for magnification but i have tried the Nikon T-Mount (available at B&amp;H) attachment with a D90 and it connected successfully. I could not recommend connecting a camera to this scope as the results were awful. It did not matter what changes to the camera settings i made i could not get any acceptable results. A different scope may yield better results but i have doubts. What do I need to attach a Nikon D5100 to a Celestron Ultima 100 or 80?